The Quach family settled in Austin in the late 1970’s to new opportunities. Many of their first experiences came from their exposure to the Chinese restaurant industry. From washing dishes, cutting and preparing meats and vegetables, to cooking on the line, and eventually, the wok cooking position. Y and Nguyet Quach owned and operated the Hao Hao Round Rock location for over two decades. 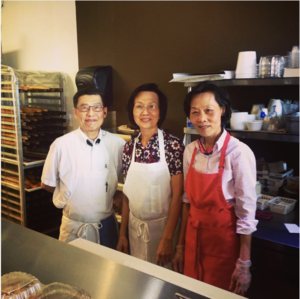 In fall 2013, with their kids all through college, they finally decided to hang-up their woks and sold Hao Hao Round Rock to focus on Nguyet's passion for baking. With that, Nguyet's signature sandwiches were born. In fall 2013, they started with a small stand in the back of the Hong Kong Supermarket and began recreating the banh mi experience. Nguyet and her sister, Minh, devoted themselves to the customer experience, in hopes of coupling Texas hospitality with the neighborly feel of the food stands in their native country. Today, the family owns Ng's Cafe (formerly known as Chang Thai Thai Cuisine) located in North Austin at 13000 N Interstate Hwy 35 in suite #200. The cafe serves it's signature speciality sandwiches and Thai-inspired cuisine. Nguyet still hand makes all the french baguettes every morning.